Your Xbox 360 Kinect unit will take pictures of you dancing to Dance Central, whether you're wearing clothes or not. Since its gala launch earlier this week, Microsoft's Kinect peripheral for the Xbox 360 has been put through its paces by press and consumers alike. The new hardware has been revealed to have some startlingly bizarre and unexpected benefits, but it's also been revealed to have some unexpected flaws. Some users have reported that Kinect has trouble recognizing them depending on circumstances like the lighting - but not, it turns out, if you aren't wearing anything at all. One unlucky gamer posted an inquiry into what may be the most hilarious Kinect-related incident yet to the Dance Central support forums. The user asked how to delete the pictures the system automatically snaps while you're busting a move. Why? I was trying out the Kinect Dance Central game and I was getting hot so I took off my clothee [sic]. I had no idea that the game was going to take A BUNCH OF PICTURES OF ME WHILE DANCING WITH NO CLOTHES ON!!! I can go back and look at these pictures but HOW DO I DELETE THEM?!!! HELP!!!! 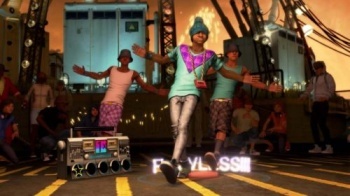 Your Xbox 360 will watch you dance, no matter what you're wearing. It will take pictures. What does it do with these pictures? No one knows. Maybe it browses through them at night. While you sleep.